Because FOX has been casting for the new season of the MasterChef Junior TV series, we knew it wouldn’t be cancelled. Still, we are happy to report it is finally official — MasterChef Junior has been renewed for season six on FOX. A culinary competition series, MasterChef Junior features home cooks between the ages of eight and thirteen, competing for the MasterChef Junior trophy and a $100,000.00 prize. 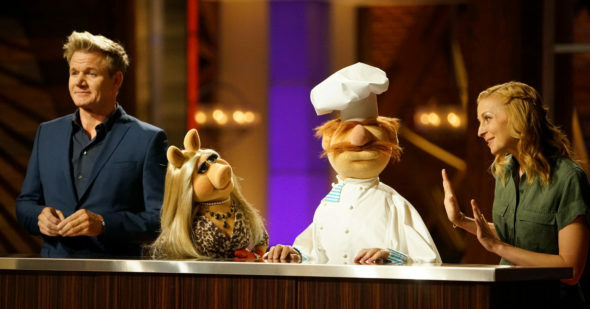 Chefs Gordon Ramsay and Christina Tosi judge the FOX series. Chef Graham Elliot and restaurateur Joe Bastianich previously served as judges. The fifth season of MasterChef Junior averaged a 1.04 rating in the 18-49 demographic and 3.54 million viewers. Compared to season four, that’s down by 16% and 14%, respectively. In the 2016-17 television season, MasterChef Junior ranking as the top unscripted FOX TV show, so a cancellation would have been far more surprising than this renewal. What do you think? Are you a fan of the MasterChef Junior TV series? Do you plan to return for the sixth season on FOX? MasterChef Junior on FOX: Cancelled or Renewed for Season Seven? MasterChef Junior: Is the FOX TV Show Cancelled or Renewed for Season Six? I absolutely love this show & yes good to watch with all ages. They need more shows like this rather than than all the garbage they allow nowadays! Yes! Absolutely! It’s so enjoyable to watch those kids cook! They’re all very talented and what is more amazing, they are kind to each other although they’re competing against one another. If this show was cancelled I would be really upset. I absolutely love this show. These kids are so skilled and great to watch. Maybe the viewes went down because we didn’t know when it was coming back and I saw NO advertisement and our cable gunder said that it was Masterchef but didn’t indicate Junior. I love Master Chef Jr! The kids look so sweet, grown up, and determined. It is definitely a pleasure to watch. Thank you to everyone that makes this show happen. This is a good, clean show that I can watch with my grand daughters, ages 6 and 8. They loved Miss Piggy’s appearance! It’s getting stale. The same old gimmicks each year. The novelty has worn off. Need a break from Gordon Ramsey. At least 24 and Prison Break had some kind of story to follow.